Different Types of TVs – Face it. Nearly every household has at least 1 TV if not more. Whatever you use it for whether that’s watching standard TV or hooking up a console to it. A TV is a must have item in every house. There are quite a few types of TVs. There is LCD, LED, OLED and QLED. LCD stands for liquid crystal display. These kind of TVs work when light from behind the TV screen shines through a lot of tiny, coloured liquid-crystal cells. A signal controls each cell letting only a certain amount of colour through to build up the picture on the screen. Led stands for light-emitting diode. These TVs are very similar to LCD however there is on big difference between the two. 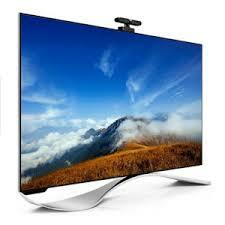 The backlit lamps that usually illuminate LCD TVs are replaced by a bigger number of smaller LEDs. These are placed either around the edge of the screen or spread across the TV behind the screen. These are also known as back-lit TVs. QLED is a quantum dot display. It uses quantum dots semiconductor nanocrystals. These produce pure red, green and blue light. All QLED TVs use photo-emissive particles. OLED panels are made from organic materials that emit light when electricity is run through them. OLED displays are much more efficient, simpler to make and much thinner. They can also be rolled or made flexible. LCD is definitely not recommended as a TV to have. We would recommend LED for the customers who have a decent budget as it is the better option out of LCD and LED. However if you have a higher disposable income then you have a choice between the QLED and OLED TV’s. They are both equally as good as Samsung and LG both make one or the other and consider their version to be the best. They are both very good. So have a good think about which type of TV is best for you.